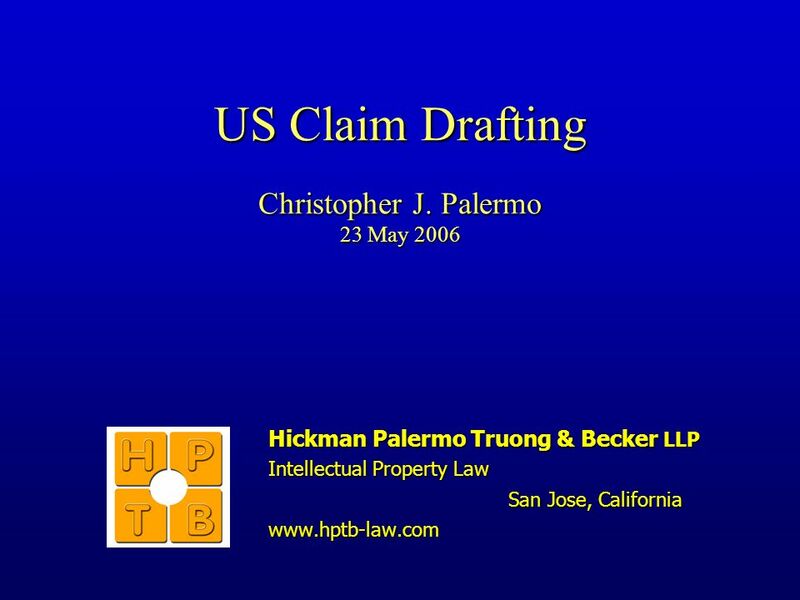 US Claim Drafting Christopher J. Palermo 23 May 2006 Hickman Palermo Truong & Becker LLP Intellectual Property Law San Jose, California www.hptb-law.com. 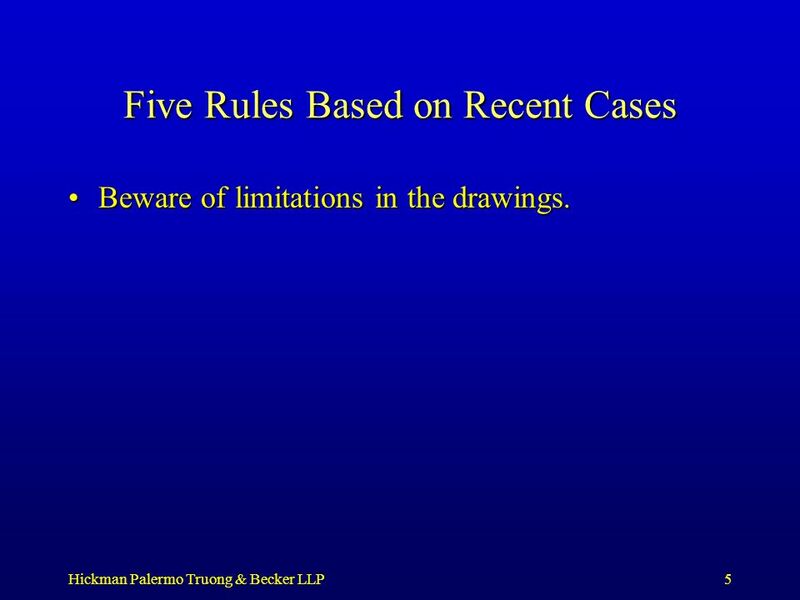 5 Hickman Palermo Truong & Becker LLP5 Five Rules Based on Recent Cases Beware of limitations in the drawings.Beware of limitations in the drawings. 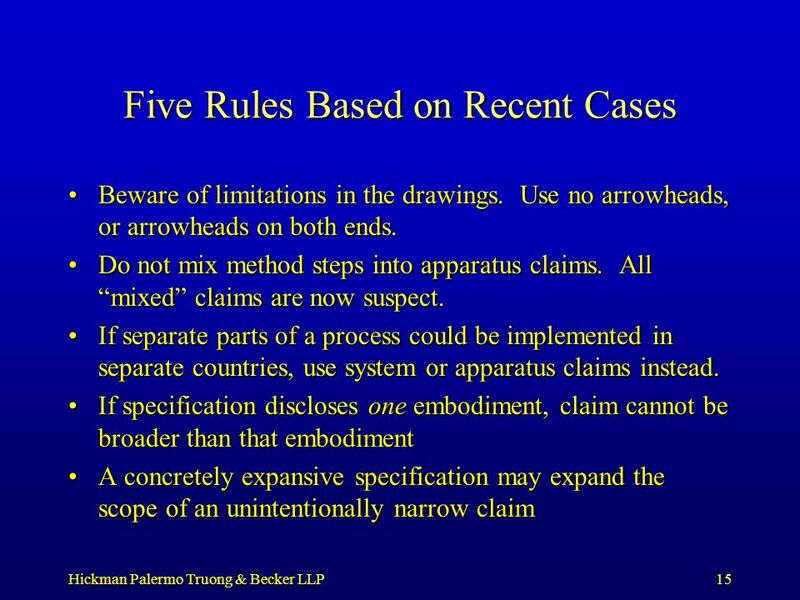 7 Hickman Palermo Truong & Becker LLP7 Five Rules Based on Recent Cases Beware of limitations in the drawings. 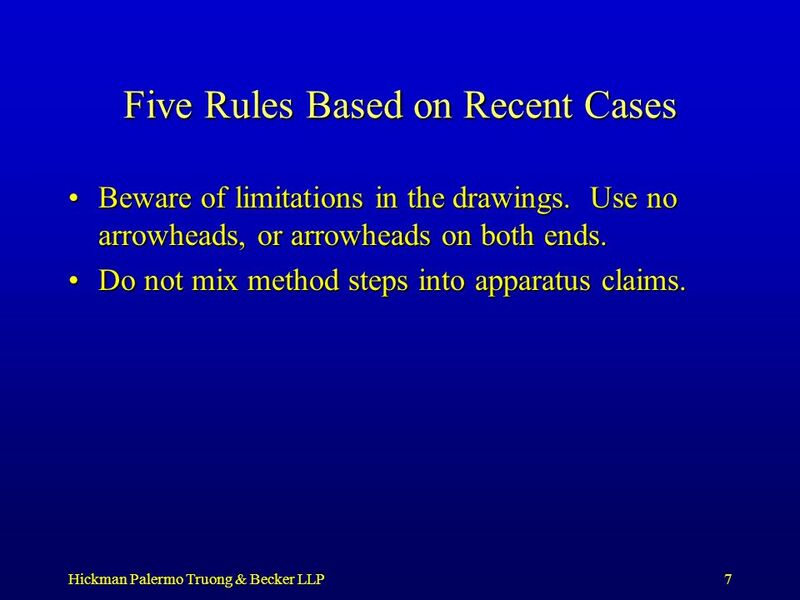 Use no arrowheads, or arrowheads on both ends.Beware of limitations in the drawings. Use no arrowheads, or arrowheads on both ends. 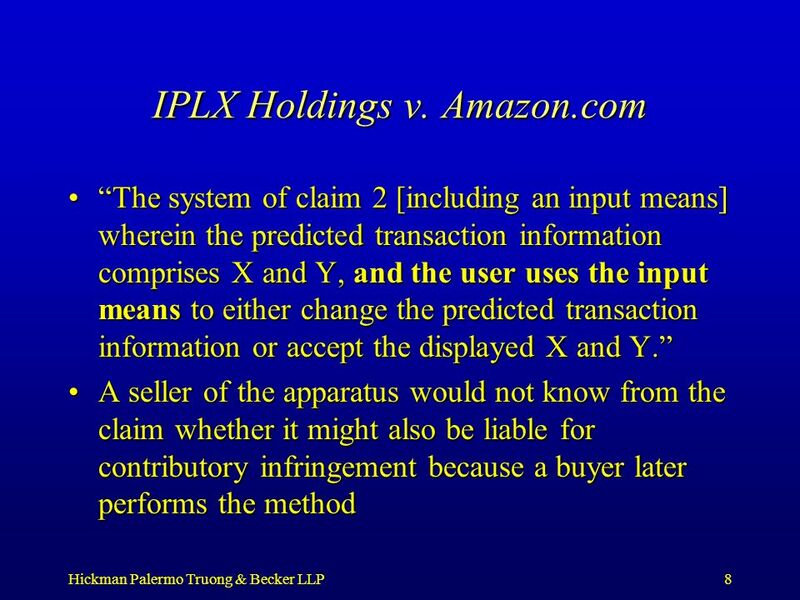 Do not mix method steps into apparatus claims.Do not mix method steps into apparatus claims. 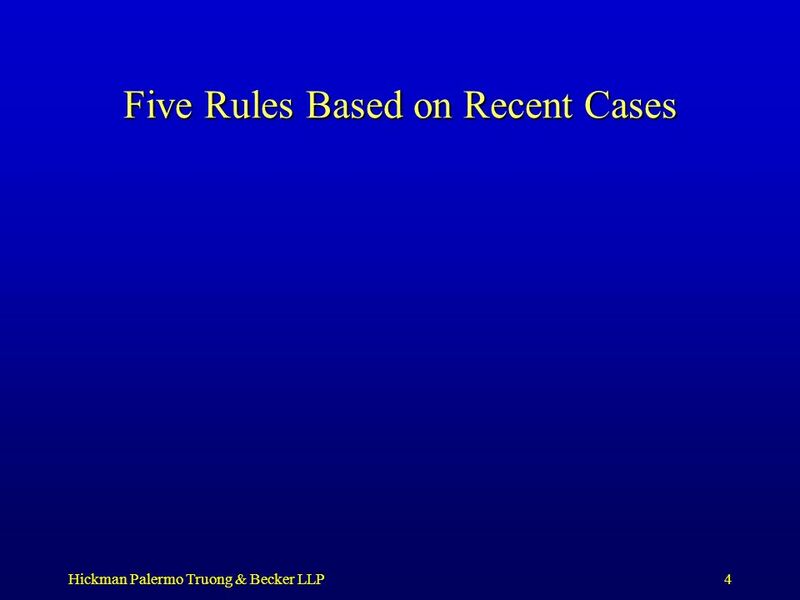 10 Hickman Palermo Truong & Becker LLP10 Five Rules Based on Recent Cases Beware of limitations in the drawings. Use no arrowheads, or arrowheads on both ends.Beware of limitations in the drawings. Use no arrowheads, or arrowheads on both ends. 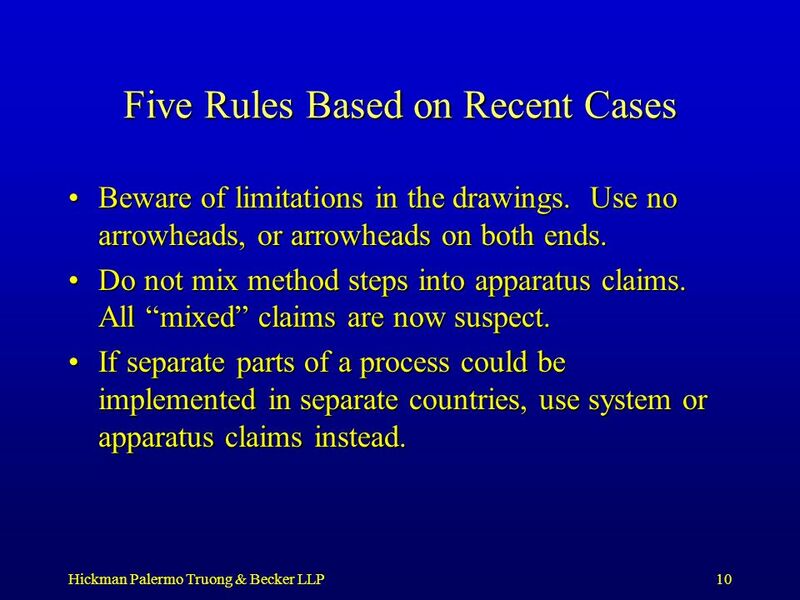 Do not mix method steps into apparatus claims. 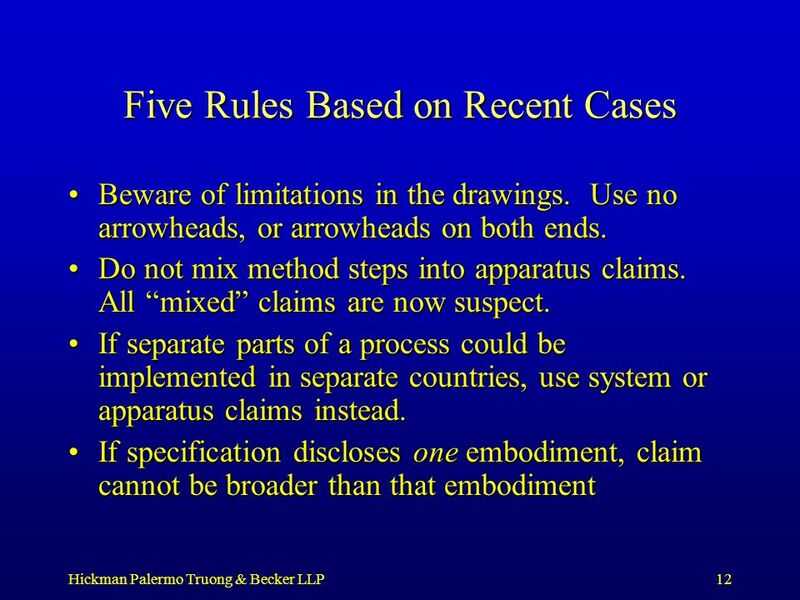 All mixed claims are now suspect.Do not mix method steps into apparatus claims. 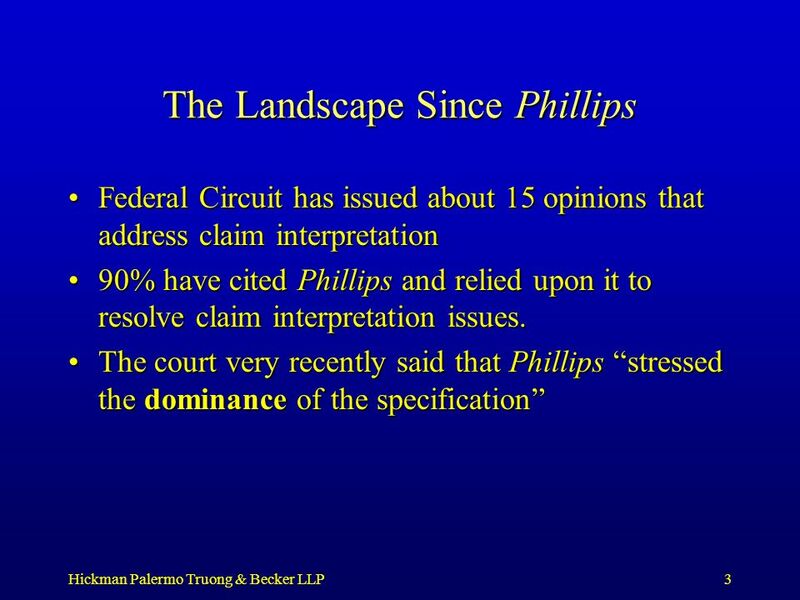 All mixed claims are now suspect. 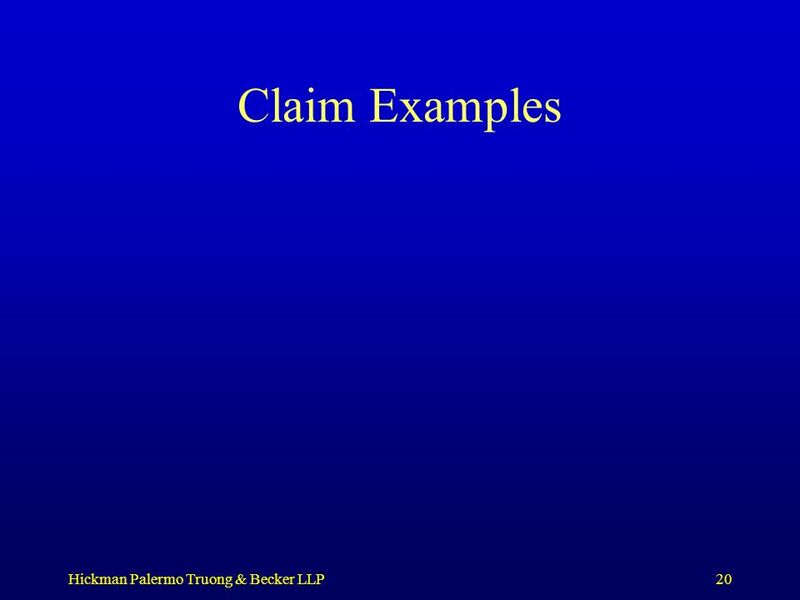 If separate parts of a process could be implemented in separate countries, use system or apparatus claims instead.If separate parts of a process could be implemented in separate countries, use system or apparatus claims instead. 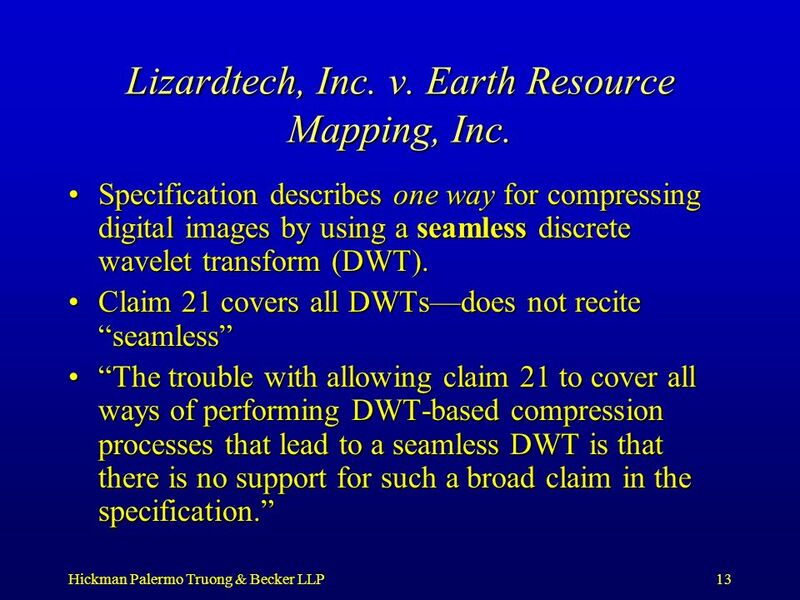 13 Hickman Palermo Truong & Becker LLP13 Lizardtech, Inc. v. Earth Resource Mapping, Inc. Specification describes one way for compressing digital images by using a seamless discrete wavelet transform (DWT).Specification describes one way for compressing digital images by using a seamless discrete wavelet transform (DWT). 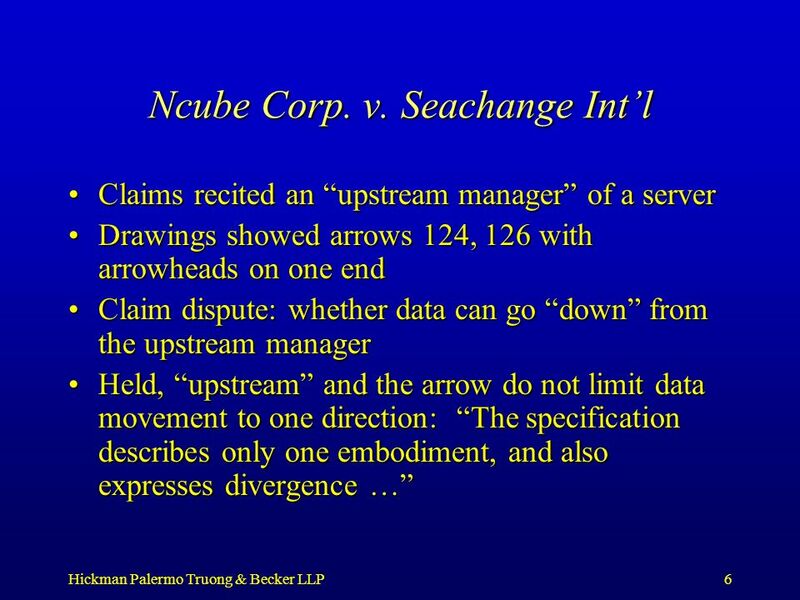 Claim 21 covers all DWTsdoes not recite seamlessClaim 21 covers all DWTsdoes not recite seamless The trouble with allowing claim 21 to cover all ways of performing DWT-based compression processes that lead to a seamless DWT is that there is no support for such a broad claim in the specification.The trouble with allowing claim 21 to cover all ways of performing DWT-based compression processes that lead to a seamless DWT is that there is no support for such a broad claim in the specification. 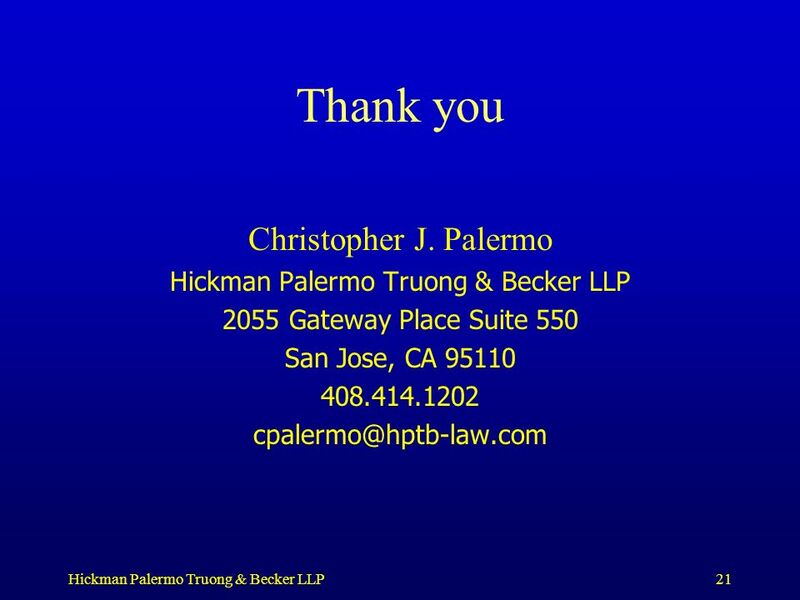 Download ppt "US Claim Drafting Christopher J. Palermo 23 May 2006 Hickman Palermo Truong & Becker LLP Intellectual Property Law San Jose, California www.hptb-law.com." SEPT. 18, 2005 (C) 2005 WU & CHEUNG, LLP1 UNITED EXPLORERS CLUB SEPT.18, 2005 How to Start a New Venture and the Role of Intellectual Property THE LAW. 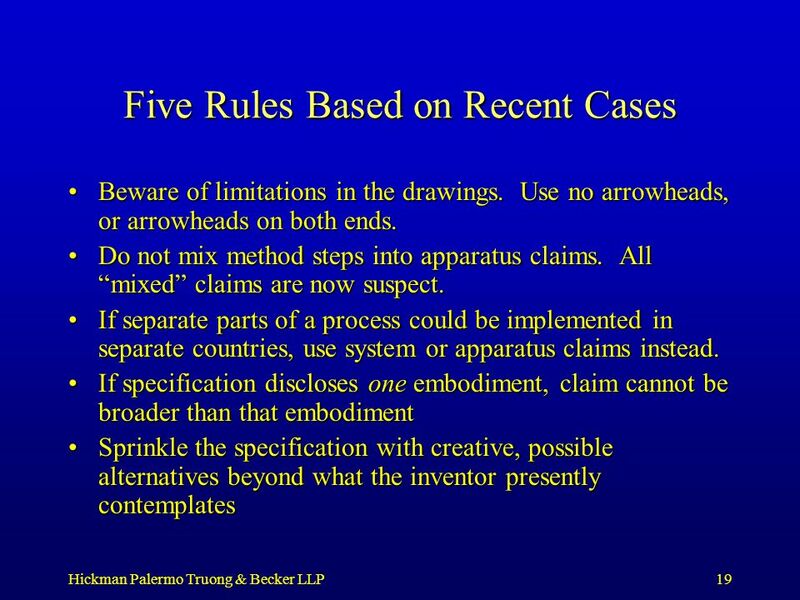 DEC. 4, 2005 (C) 2005 WU & CHEUNG, LLP1 TAIPEI ECONOMIC CULTURAL CENTER DEC. 4, 2005 The Role of Intellectual Property in the Business World THE LAW OFFICES. 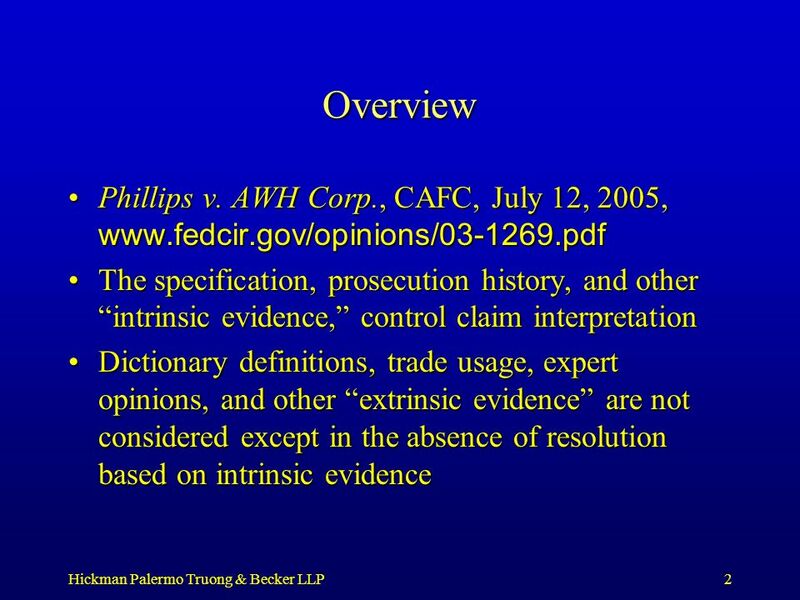 Williams v. Sprint/United Management Co.
E-vidya brings a world of discovery into your classroom. E-vidya brings to you Digital Class - that combines the state-of-the-art hardware. 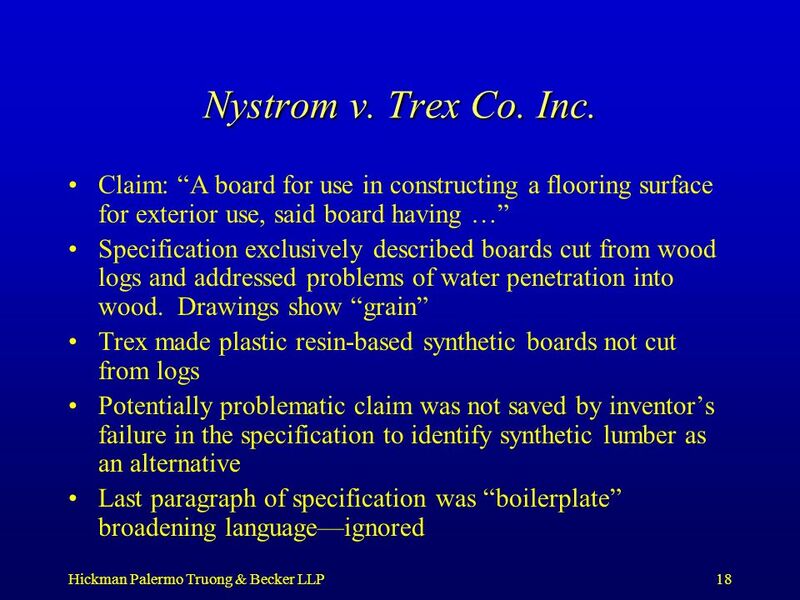 BLAW 2010 Patent Project Part 1I. 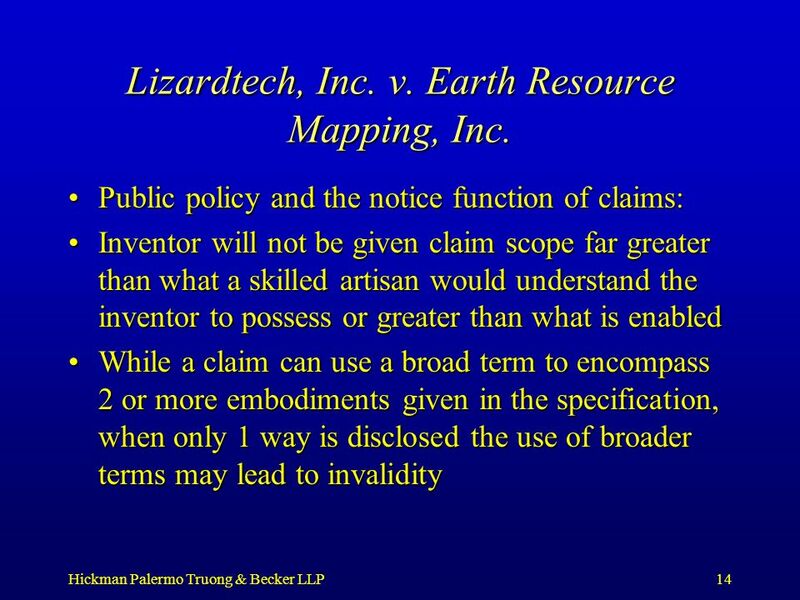 Why do we have patent laws? 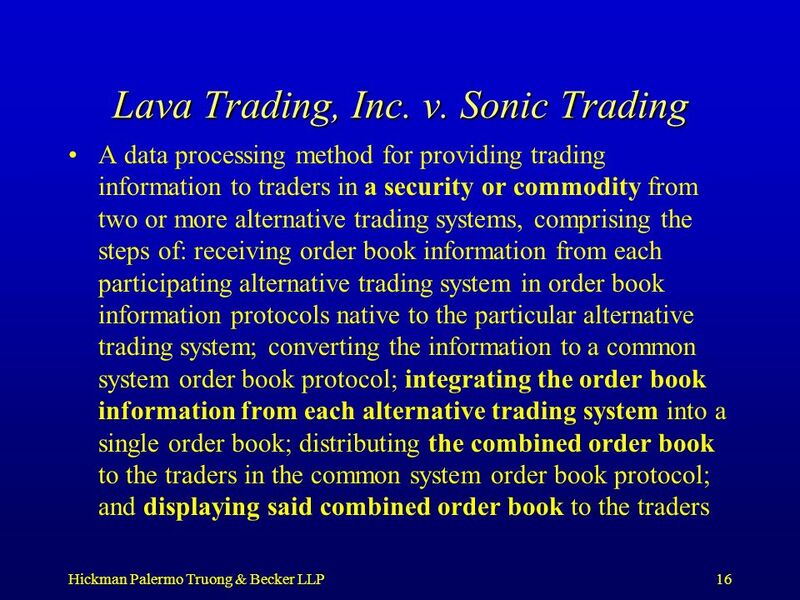 UNITED STATES PATENT AND TRADEMARK OFFICE A full transcript of this presentation can be found under the “Notes” Tab. 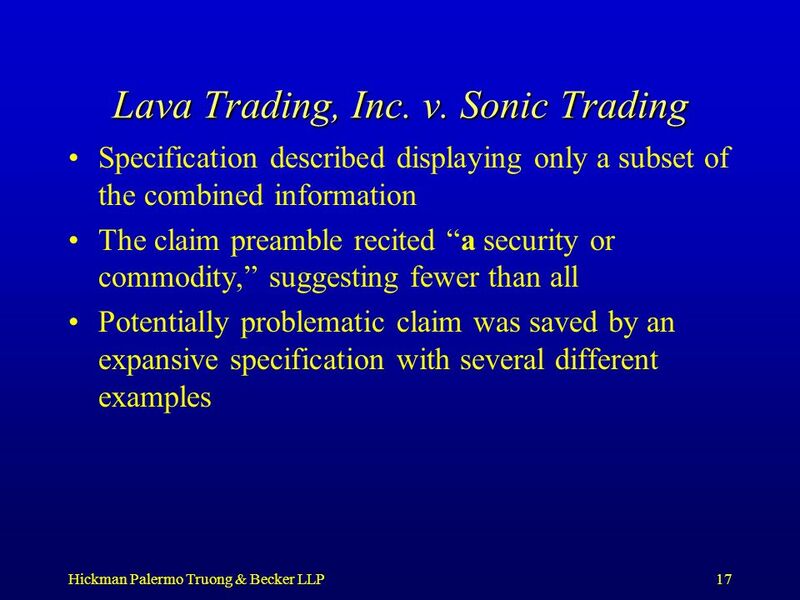 Claim Interpretation: Broadest Reasonable. 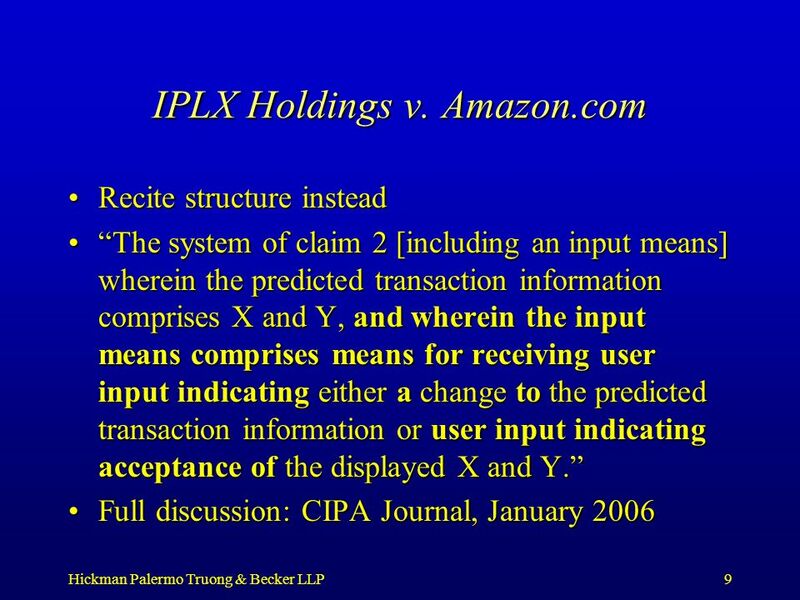 Patent Law and Policy University of Oregon Law School Fall 2009 Elizabeth Tedesco Milesnick Patent Law and Policy, Fall 2009 Class 11, Slide 1. 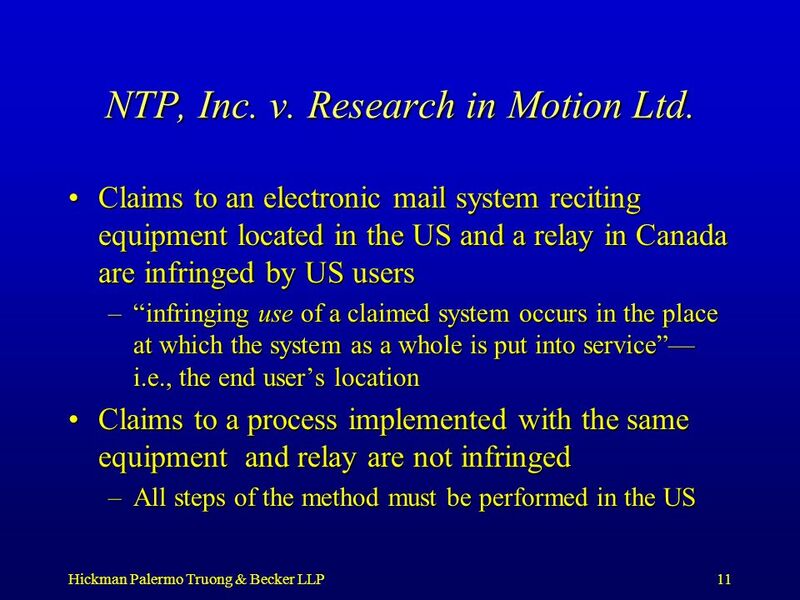 Intellectual Property Boston College Law School March 5, 2008 Patent – Nonobviousness 2.